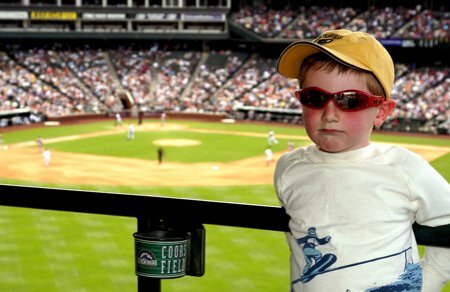 The Top of the 5th, that’s how long a 4 and half year old lasts at a Rockies Baseball game. A wad of Cotton Candy big enough to choke a man, small work for the dynamo. Chase it with a hot dog and wash it all down with a Sprite. Buuuurrrrppp! Good to go for the next hour and then BAM! The sugar wears off and he’s ready for a nap. Time to go home. This is such a great shot… his slightly sad and bored expression in the midst of a ball game is truly priceless!